Nature and Heritage in an unforgettable 12-hour tour, departing from the center of Madrid. 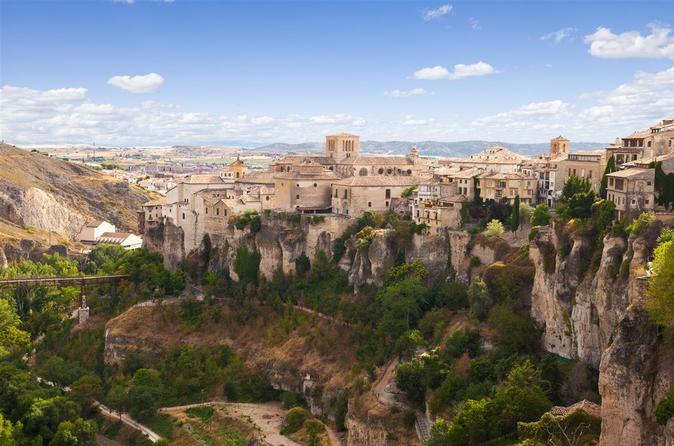 Know the city of Cuenca, declared a World Heritage Site by UNESCO, and the Enchanted City, a natural paradise declared Natural Site of National Interest for almost 100 years. We will stop along the way at the Finca La Estacada winery. We will stop at Ventano del Diablo, a canyon that the River Júcar has prayed on the rock that once was the bottom of the Tethis Sea. Surprise yourself with the panoramic Tour by the Hoz del Huécar, under the hanging city of Cuenca. We leave at 9:15 am from the center of Madrid, in Calle San Bernardo, Nº7. Our bilingual guides will accompany you from the beginning of the excursion, which will be done by bus or minivan. On the way to Cuenca we will make a brief stop at the Finca La Estacada Winery, to go to the bathroom or have a coffee contemplating its magnificent views over the vineyards of La Mancha. After another journey we will visit the Enchanted City: Do not expect to find high buildings or old monuments in this particular place, because this site is kept to teach you the wonders of the nature of Cuenca. It is here, almost 1,500m. Of altitude, where Nature makes a very nice present to the traveler: The Enchanted City. Many films have been made here because of its landscape and the silence of the mountains. Its paths encourage you to stroll through curious stony forms that recall human figures, objects, animals, with a precision difficult to understand, until you get a delirious city, a city built by some kind of mysterious spell. Later we will go to eat in the City of Cuenca. If you have hired food, the bus will take you to our restaurant. If you have chosen the option "Without Lunch", we will leave you in a restaurant area, where the bus will pick you up again at the time set by our guide. After lunch we will make beautiful a panoramic tour by bus, under the Hanging Houses on the Huécar River Sickle, to the Barrio del Castillo, the highest part of Cuenca, from where our guided tour of 2 hours will start. In this walking tour, the interiors are not accessed. THE CITY OF CUENCA: declared World Heritage Site by UNESCO, is one of the cities with the most material and immaterial wealth of Spain. Cuenca is a city built on top of a high point surrounded by two rivers, Júcar and Huécar, which gives an incomparable natural setting. The gorges enclose an immense historical patrimony that is interlaced between two precipices. Essential for the traveler will be to travel through its old town and get lost walking around its enchanting alleys full of important examples of religious heritage such as churches, convents, seminars, and the contrast of museums like. The most impressive building of the city, the Cathedral of Our Lady of Grace, the first example of Gothic art in Spain was raised by order of Alfonso VIII. The most known location of the city are its famous Hanging House ,an example of popular architecture typical from Cuenca. Other examples of this typical architecture are the Skyscrapers of San Martin, the first buildings in the world with more than ten floors. The Bridge of St. Paul becomes a nice walk for the daring and an adventure for the vertiginous, but everyone leaves with the same feeling of being in one of the best places in the city. No doubt: Cuenca is unique!